Six days is not nearly enough time to experience the culinary pleasures that New York has to offer. I had grand plans to visit places such as Babbo (Mario Batali’s restaurant in Greenwich Village), Dominique Ansel (the bakery that created the cronut – a heavenly cross between a donut and croissant), and the Milk Truck, but unfortunately time got away from us and we ate wherever it was convenient. That is not to say that our taste buds suffered as a result – that is indeed not the case – but rather we just ate at restaurants that were close by and in doing so were able to experience some of the best New York food along the way. Amy’s Bread: I’ve said it once, I will say it again – Amy’s Bread! I’ve already mentioned the Coconut Dream Bar, but the German Chocolate cake and bread twists were some other favourites. Mike had the Manhattan Breakfast with Coffee one morning and he enjoyed it very much! Amy’s Bread also offers bread-making classes, which is something I am going to do the next time I go to NYC!!! Magnolia Bakery: this place is always busy, but the Key Lime cheesecake and Oatmeal Raisin cookies made it worth the wait in line. Cupcakes seem to be the dessert of choice for most patrons and they were able to sell me a coconut cupcake, or two J.
Carnegie Deli: the food portions are huge, so you may want to share with someone. Mike had the corned beef sandwich and because I don’t eat meat, he was on his own and did not mind one bit. 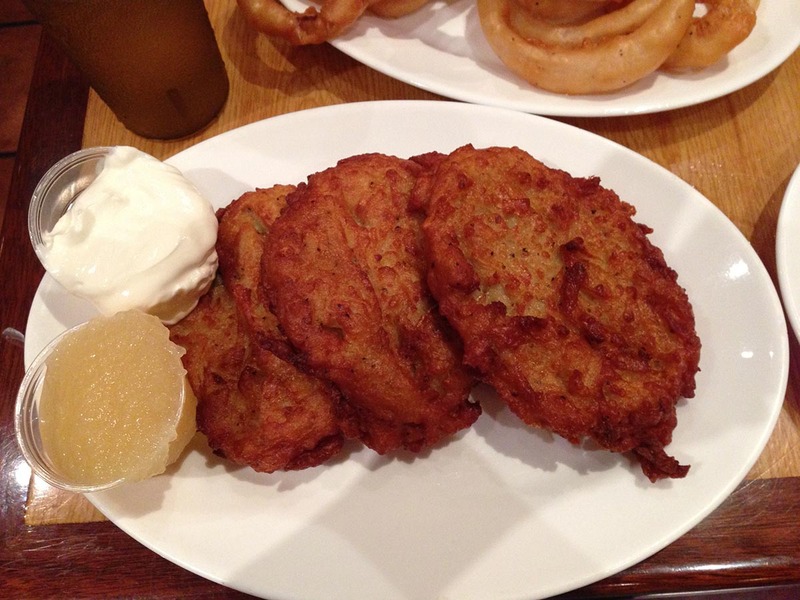 Instead I had the potato pancakes, which were ginormous, and although they were good they were a bit too much for me. On top of that, Mike ordered onion rings because why wouldn’t we want onion rings? Going at night allowed us to get a table easily, but when we were leaving a line up was beginning to form. 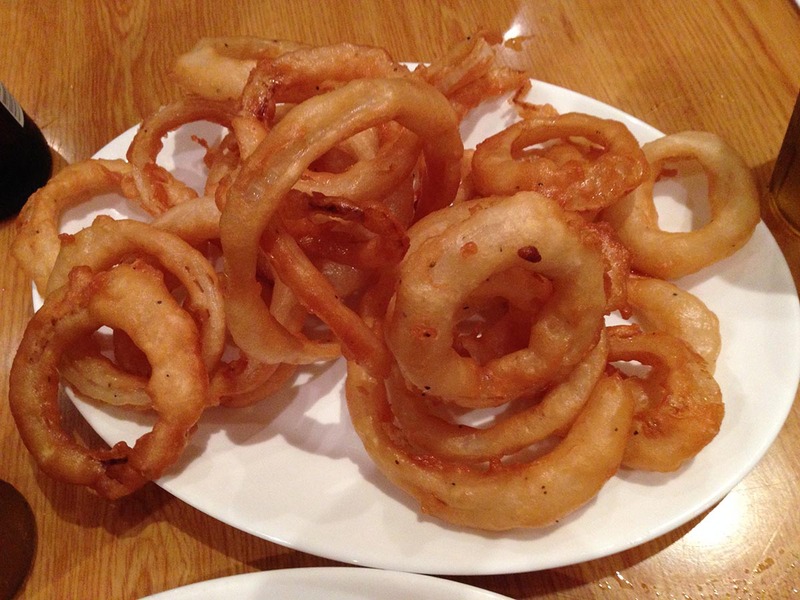 Onion rings as a side dish. There was like a pound of meat in this sandwich. Mike was not able to finish the whole sandwich, but really who could eat all of this in one sitting? Potato pancakes, good but I probably shouldn’t have ordered them in a place that specializes in smoked and cured meats. For me, the atmosphere and decades worth of pictures hanging off the wall at Carnegie Deli was more of the appeal than the food itself. 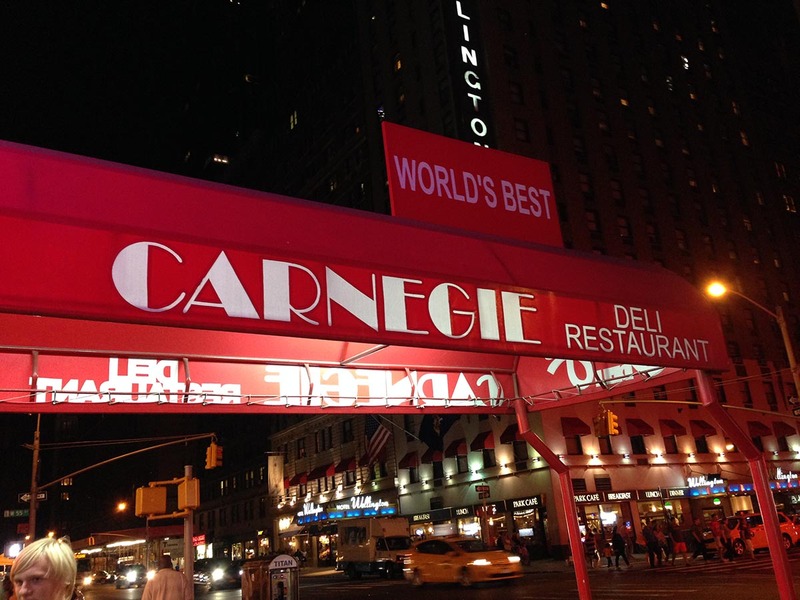 I’m sure you would get a different opinion from a meat eater or Rueben sandwich connoisseur because Carnegie Deli is famous for its meats. Trattoria Trecolori: before going to see the Book of Mormon, Mike and I wanted to go to a nice Italian restaurant close to the theatre. 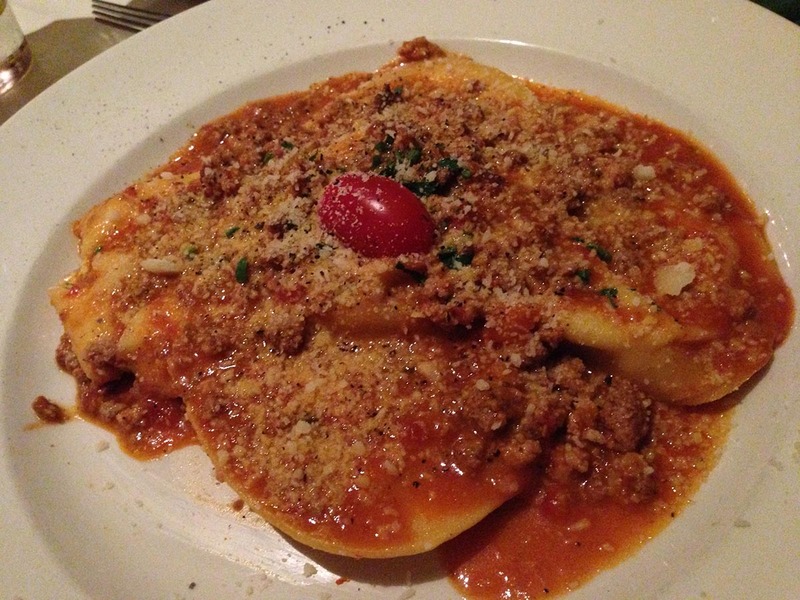 Walking around, we came upon Trattoria Trecolori and thought “why not”? We were pleasantly surprised – the food was authentic and delicious, the service was great, portions were just right, and the prices were completely reasonable. Mike had the ravioli, which was stuffed with different cheeses . . . hmmmm delish. I had the Linguine Nere alla Monsignore, which was linguini with shrimp, scallops, squid, clams, and mussels in a marinara sauce. 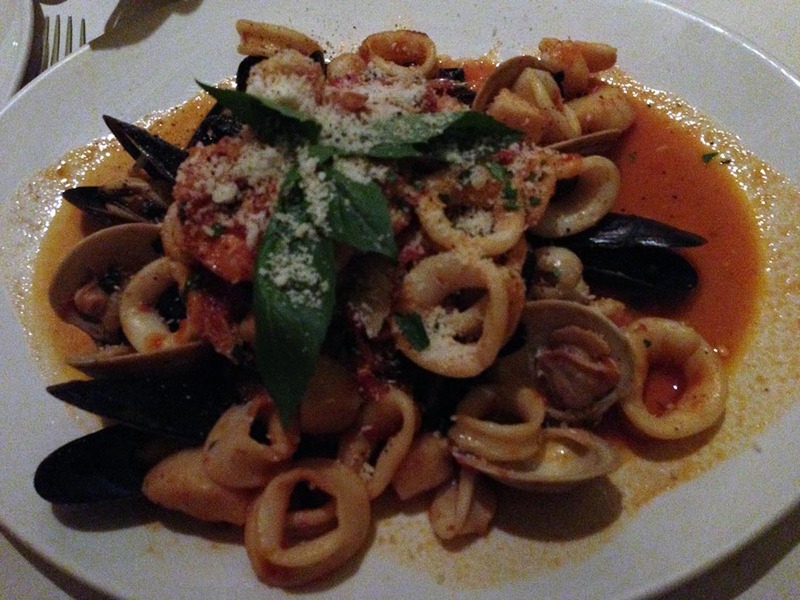 The dish satisfied both my craving for pasta and seafood! 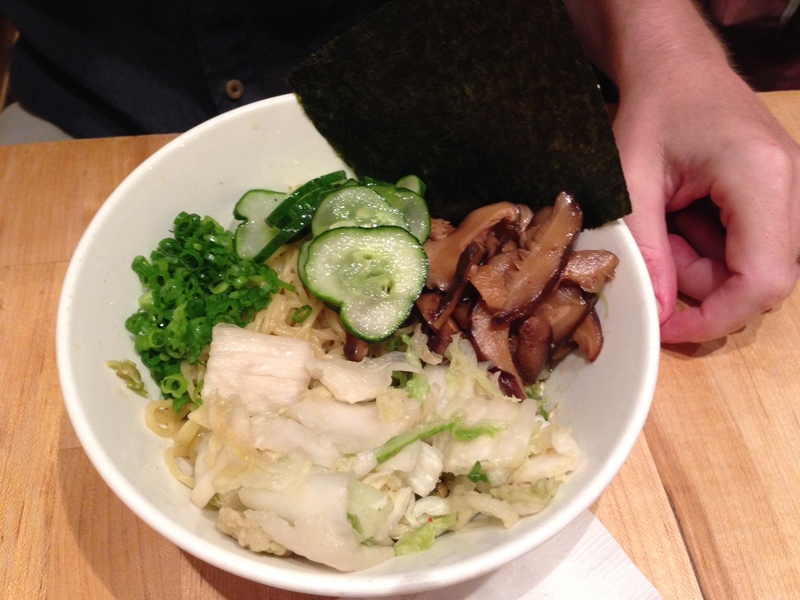 Momofuku Noodle Bar: this is one of the best places in New York for Ramen. It is located in the East Village and we would have overlooked this little non-assuming restaurant if we weren’t specifically looking for it. I jumped for joy when we finally found it and realized that there was no line up. I had read from a number of reviews that it was best to go at off-dinner hours or else you would wait in line for a long time. I had the spicy miso ramen, which was served with smoked chicken, a poached egg, and sesame. The noodles were succulent and perfectly cooked, not soggy, and the broth had a depth of flavour that when mixed together with all the other ingredients it was truly an orgasmic experience. 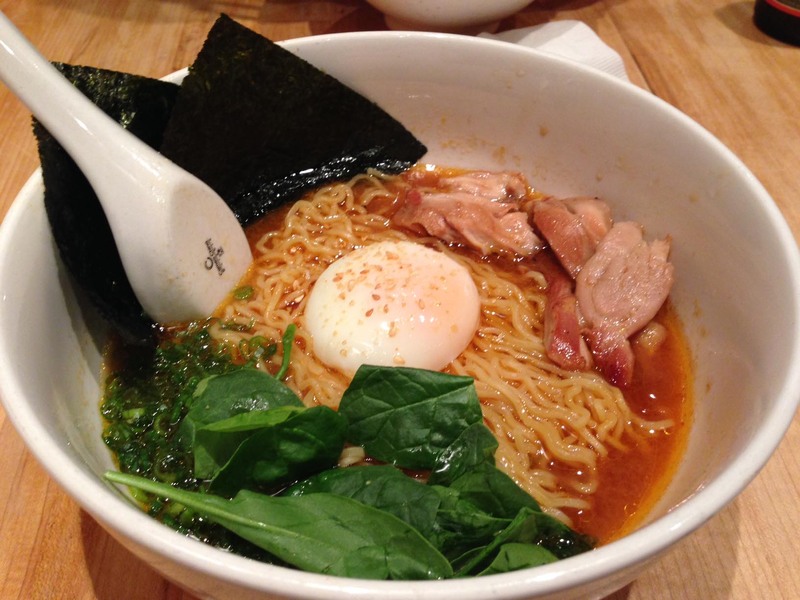 Momofuku’s spicy miso ramen . . out of this world! 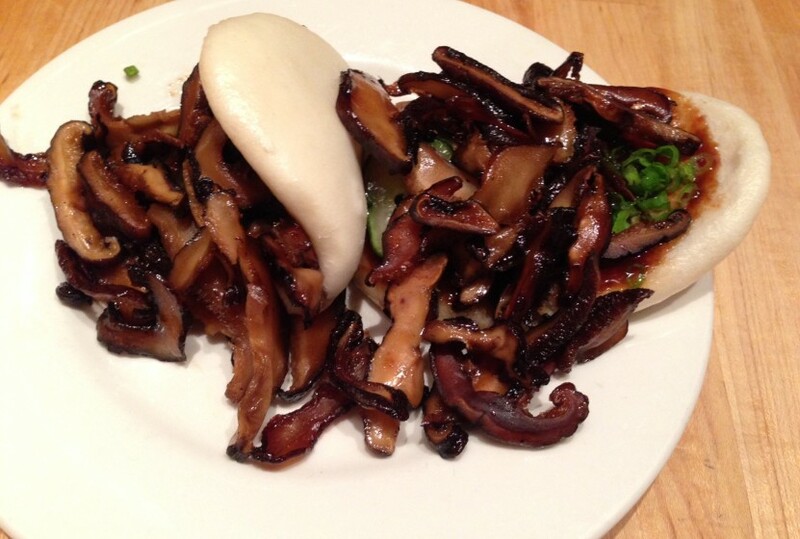 We also ordered the shitake mushroom buns and I had no idea what I was getting into until after the first bite. I grew up eating buns – Bun Bao, Banh It Tran, all sorts of Chinese buns – but this was gastronomic heaven!!! There was a unique flavour from the hoisin sauce and shitake mushrooms, and when you combined it with the cucumber it helped to lighten the palette and not overwhelm as it often happens when you have too much hoisin sauce in a dish. Not to mention, the buns themselves were light and fluffy so when you put it altogether you have the perfect balance between taste and texture. This place is definitely a must try! Steak and Shake: after the David Letterman Show we stopped in for a shake. The Oreo Cookies N’ Cream shake was definitely the cherry on top of a great day! 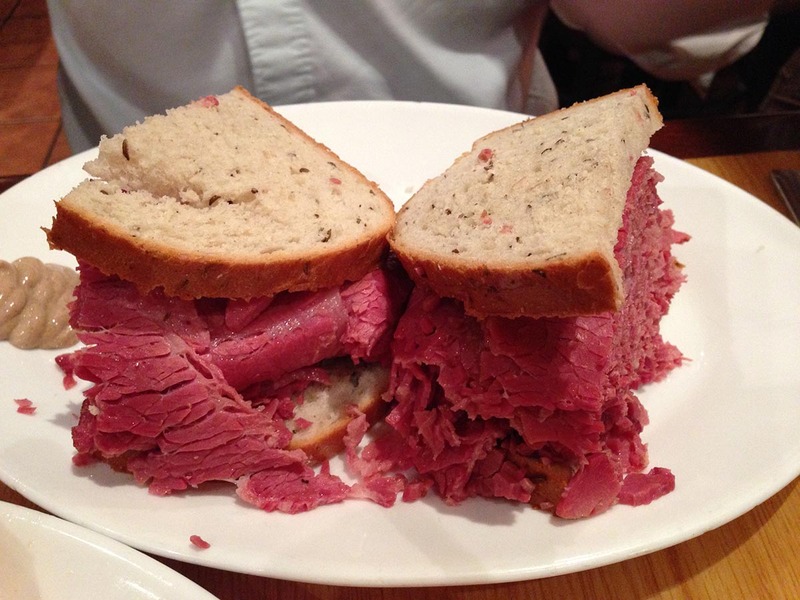 What are some of your favorite New York food places? Let me know so I can check it out next time. Want to find out more about New York?